A cache of data leaked from the state's electoral commission points to an overwhelming victory by opposition presidential candidate Martin Fayulu, reinforcing earlier calls by regional organisations for a recount. The leaked data starkly contradicts the official results announced on 10 January which purport to show that another opposition candidate, Félix Tshisekedi, who is thought to have agreed a political fix with outgoing President Joseph Kabila, had beaten Fayulu by about 650,000 votes. The data was smuggled out of the country after it was leaked from the official electoral commission, the state-run Commission Electorale Nationale Indépendante (CENI). The leaked data indicates that, in fact, Fayulu beat Tshisekedi by over five million votes (AC Vol 60 No 1, Church claims sweeping opposition win). The leaked data covers over 80% of the votes cast in the 30 December general election and closely matches voting data gathered independently by the Catholic bishops' organisation, Conférence Episcopale Nationale du Congo (CENCO), which fielded 40,000 observers across the country. 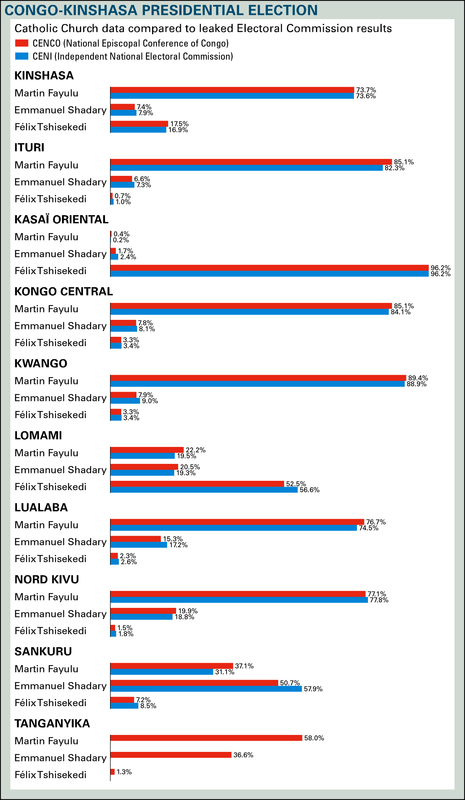 As our table shows, both sets of data record Fayulu winning heavily in the Kinshasa, Kongo Central and Ituri electoral districts in the north-east while Tshisekedi sweeps the board in his home base of Kasaï. Africa Confidential, which has seen the leaked figures along with media groups such as South Africa's Daily Maverick, the London Financial Times, Radio France International and France's TV5, has tested their authenticity with data and voting experts, as have the other organisations. The escalation of Congo's election dispute presents another challenge to Kabila. Political insiders say the deal struck with Tshisekedi was intended to allow outgoing President Kabila to rule from behind the scenes after he leaves office. One reason for the deal was the abysmal showing of Kabila's favoured candidate, Emmanuel Ramazani Shadary. Despite substantial state resources behind his campaign and backing from the incumbent, Shadary won less than 20% of the votes, according to the leaked CENI data. 'Too low … even to rig him in,' commented one of Kabila's advisors. Those close to the negotiations between Tshisekedi's team and the Information Minister Lambert Mende suggest that Kabila would retain extensive powers over security and mining contracts under a Tshisekedi presidency. On 11 January, Fayulu submitted an election petition to the Constitutional Court which will decide on the matter within a week. Fayulu claims that the tally sheets from the 75,000 polling stations show him winning 61% of the vote. We understand he is basing his petition on the opposition alliance's own figures gleaned from its polling agents, together with the leaked CENI data and the CENCO figures. CENCO briefed and produced data for several diplomatic missions in Kinshasa, including South Africa, on 2 January. France and Belgium have both made separate statements questioning the official results. On 13 January, the Southern African Development Community called for a recount and suggested that a power-sharing government might be the best way out of the deepening crisis. The following day the International Organisation on the Great Lakes Region added its weight to calls for a recount. That spurred Kabila's emissaries to push back against the toughening regional stance. On 14 January, Zambia's foreign minister Joseph Malanji held an awkward press conference and rowed back from the recount call. His South African counterpart, Lindiwe Sisulu, also issued a statement withdrawing the demand for a recount. But by then doubts about the legitimacy of the results – and their capacity to spark more chaos even if Kabila was vacating the presidency – had spread across the region. There were street protests against the result and clashes with security forces in parts of Kinshasa, Kisangani and in Kwilu province, although they have not yet escalated. Some fear that disputes over the results could spark fighting in the volatile east. After 7 January, armed insurgents killed more than 25 people near the city of Beni, a Fayulu stronghold where the electoral commission said it suspended elections over concerns about an Ebola outbreak. Many doubted this was the real reason as all the rival parties had been allowed to campaign in the area for several months. The basis for a deal between Kabila and Tshisekedi had been the outgoing President's fear of Fayulu's backers. Two ministers contacted by Africa Confidential said that as soon as it became clear to Kabila that voters had given Shadary a wide berth, Kabila opted to treat with Tshisekedi, who could at least deliver an additional important geopolitical bloc worth another 25% in votes as well as the troubled Kasaï region, Tshisekedi's bastion. Speculation about a back-room deal between Tshisekedi and Kabila had grown after Tshisekedi's spokesperson Jean-Marc Kabund announced on 7 January that the two men had 'an interest in meeting to prepare for the peaceful and civilised transfer of power'. Tshisekedi and his ally Vital Kamerhe had stoked suspicion when they broke, after only a day, an agreement struck in Geneva in November for the entire opposition to unite behind Fayulu, sparking a bitter war of words and suspicion between their supporters (AC Vol 59 No 25, The Twelve Fixes of Christmas). Félix Tshisekedi, who inherited the mantle of the UDPS when his father Etienne Tshisekedi died in 2017, will make a pliant president, says insiders. The UDPS has already been fractured by Kabila, who co-opted part of it during the explosion of violence in Kasaï in 2016 and 2017. With no experience of government, Tshisekedi lacks strong links to the security services and the military. 'Félix will not have the capacity to challenge Kabila's machinery, and he'll be held hostage from his first day in office, gun to his head. In that sense, he is just a fig-leaf behind which Kabila can claim untruthfully that he has relinquished absolute power,' said a senior official in the United Nations Department of Peace Operations. The ruling Front commun pour le Congo (FCC) has retained control of parliament – in a result also expected to be challenged – by winning 288 of the 500 seats, while Tshisekedi's Union pour la démocratie et le progrès social (UDPS) managed only 46, against 94 for Fayulu's Lamuka coalition. As the largest party, the FCC will choose the prime minister and can constrain Tshisekedi's room for manoeuvre. Tallies for provincial elections also look like giving Kabila's allies the majority of seats in key provincial assemblies. A report by French channel TV5 this week showed a tallying centre in the eastern city of Goma where ballots and minutes of results remained uncounted even though the provincial results had already been announced. With Kabila set to become a senator for life under constitutional rules governing the role of outgoing presidents, he could hold power over Tshisekedi through his control of the FCC and parliament's power to impeach the president. It would be easy for him to block Tshisekedi's agenda and his governmental appointments. The prime minister's countersignature is required to implement presidential ordinances. The premier also chooses ministers for approval by the president. Fayulu, a former ExxonMobil executive, is backed by former Katangan governor Moïse Katumbi, former Vice-President Jean-Pierre Bemba and ex-foreign minister Mbusa Nyamwisi, the latter two of whom are also notorious former rebel leaders. These three heavyweights represented a serious threat for Kabila, who fears that if Fayulu won they would be called upon to dismantle the president's grip on the security services and financial machinery of the state. Nyamwisi has taken on the security services. Previously one of the sponsors of the Mouvement du 23 mars (M23) rebel group that took the eastern city of Goma in 2012, he has been locked in a war of words with Kabila since 2014, trading accusations that each was responsible for massacres against civilians that have killed thousands (AC Vol 59 No 23, Militias flex their muscles). The African Union remains divided over its next actions having earlier called for legitimate election results to be published. That has not happened by any stretch of the imagination. Prepared for Free Article on 26/04/2019 at 05:00. Authorized users may download, save, and print articles for their own use, but may not further disseminate these articles in their electronic form without express written permission from Africa Confidential / Asempa Limited. Contact subscriptions@africa-confidential.com.